You are currently browsing articles tagged Manga. I will be a guest at OtakuCon this July! I am very excited and honored that the organizers take me seriously. I know that I don’t. So you should all come to see me if you can. I will be captaining a vendor table the first day, selling used manga from my back stock at the store. My uncirculated stock. Fresh old stuff, if you will. I will also have Japanese import candy and soda, and whatever else strikes my fancy. The second day, I’m told I will have a panel at 11ish. I will bring a notebook if you bring your reading recommendations. Just keep in mind that if I’m going to review anything for the podcast, then it must be currently in print and available. I love to read new things, but I don’t want to be recommending things that are only available on scan sites. As a run up to the con, I am reading and reviewing more manga than is strictly normal for me. I’m having fun, reading some things that I would not normally have time for. I was going through my shipment a couple of Wednesdays ago and I was struck by how much I liked the artwork. I flipped through the volume, eyeing the clean lines and graceful fluidity of the action panels. Then I read the synoposis. A highschool full of the clones of famous people? Scientists, musicians, politicians and mad despots? Sci-fi intrigue with just a hint of adolescent angst? I thought to myself “I am so on board”, and I was not disappointed. The story told is a really basic fish-out-of-water, coming of age story starring Shiro Kamiya, son (biologically and everything) of the school’s head scientist. 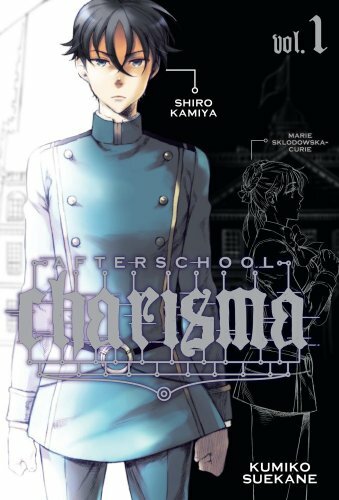 All of the other students at the school are clones, like Marie Curie, Sigmund Freud, Napoleon Bonaparte, and well, Adolf Hitler. All of the clones are being trained to live up to the lives of their originals, and Shiro is thrown into the mix as an outsider. Most of the students are nice enough to him, but treat him with a certain distance. When armed guards are seen patrolling the halls, it definitely feels as though things are not as they seem. This book is a solid first volume and I really enjoyed reading it. There are some moments of dark foreshadowing, and a surprising amount of booby for a teen book, but I had a great time and I look forward to volume 2. Next I read the Kingyo Used Books. This one hit close to my heart, because at its center it’s a story about how important books and stories are to us, and how they shape us and our relationships. 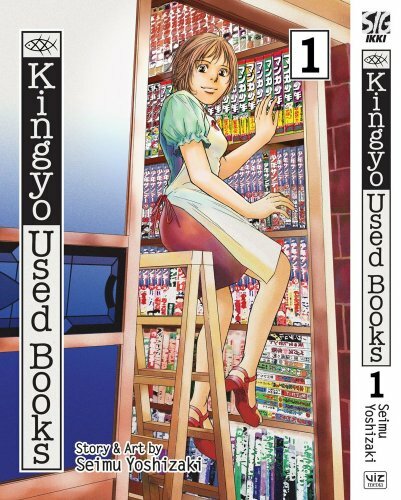 It collects a handful of short stories that all take place in and around the Kingyo Used Book shop. Friendships are reaffirmed, childhood’s remembered, and inner peace found (through archery in the stacks, but still). This volume is melancholy and sweet, and served well to remind me why I am so happy selling comic books. Emotion aside though, Kingyo is also a guide book to Japanese manga, including detailed footnotes on books mentioned within the story. I am sad that the footnotes are all for the Japanese versions of the stories, as a lot of the series mentioned are either out of print in the US, or have not seen print here yet. I really like the idea though, that if the sweet story of the bored housewife and her shojo make you want to read more, then the information is right there. In non-manga news, Matt has made me promise to read Scott Pilgrim. I have been avoiding it because it is so stereotypically a “girl comic”, but with the movie coming soon I’ll give it a shot. He is loaning me the first one right now, so fingers crossed. Don’t forget to come see me at Otakucon. You can still preregister online at the OtakuCon Website, or you can by early tickets at Uncles Games in the Valley Mall. Free Comic Book Day was on Sat May 1st. I know it has been awhile, but it was so much fun, I feel that I have to mention it. Very big thanks go to Mark and Carly, both of whom helped me a lot by manning (or womanning, in Carly’s case) the counter so I didn’t have to worry about it. We actually almost ran out of comics twice, and Craig had to do emergency runs from Division with more. 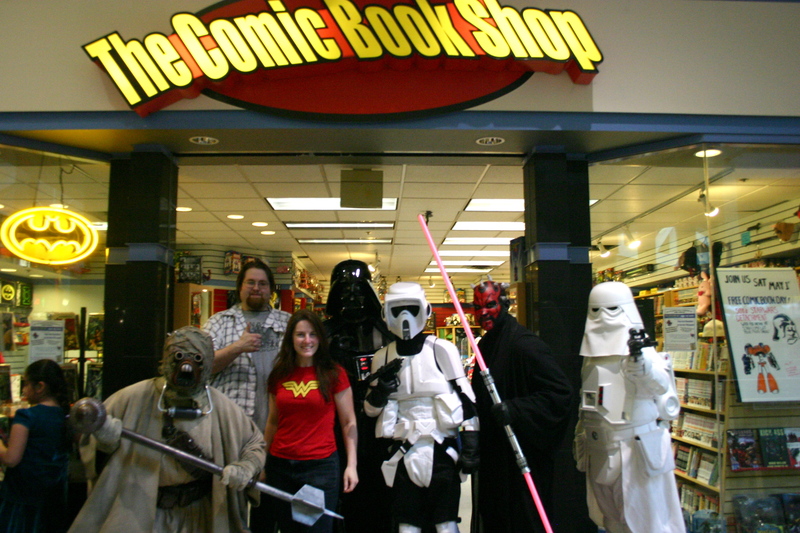 And when it came time for the 501st guys, the area around my store became a sea of people. Next year I will have to implement some kind of crowd control scheme, because it was insane. It was so much fun though. I always love these social events, which is so weird. Usually I’m a complete hermit, but Free Comic Book Day and the local Comicon are just about my favorite days of the year. Speaking of which, we also went to Spokane Comicon and had a table. Craig and I sold a ton of shirts and a sadly much smaller number of DVDs. I got to see a lot of people that I don’t usually get to, and I had the best time. I even got to talk to the very nice John Layman and have my copy of Chew #1 (2nd printing) signed. I got into a conversation with him and Rotten creator Mark Rahnor about retail marketing. It was kind of surreal, because these guys are well-respected creative types, and they were listening intently and taking me seriously. I will have to do a special on retail and marketing for self published creators. It seems like after all these years in retail there is a lot of stuff that seems like common sense to me, but that the actual people that make the books don’t think about. Small things like book dimensions can make the difference between stores carrying your book and letting it go. If your book isn’t in the store, it can’t sell. We’ll have to revisit this. Ooh, one more picture from Comicon. Both of these images are via the Sasquad Comic Book Club. A lot of the Sasquad folks are regulars of mine and they are all great. One of them managed to get a picture of Eric (my husband) and his creative partner Manny at their table. This year they were selling their books and their brand new poster prints. Look how cute they are. I’m going to get in trouble for this. Finally I am reviewing a book in this week’s podcast. 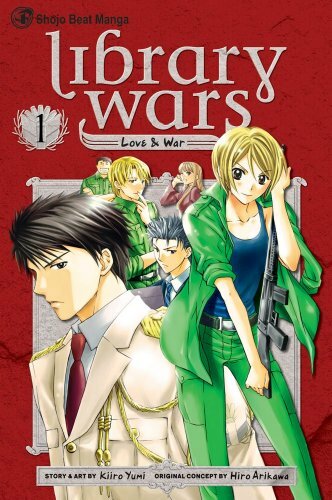 I had the pleasure to read Library Wars Vol 01 with art and story by Kiiro Yumi, taken from an original story by Hiro Arikawa. This was a pretty big step away from what I normally read, manga-wise, but it was so very enjoyable. Library Wars tells the story of Iku Kasahara and her Library Task Force training. The LTF exists to protect books and peoples right to read them from the forces of a fascist-sliding future Japanese government. The government forces have been going into bookstores and pulling “objectionable” titles off the shelves and then burning them. It’s sort an prequel to Farenheit 451, only with angsty romance. 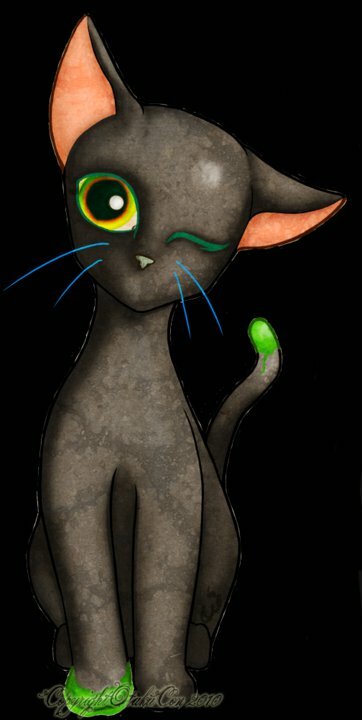 Iku is a tough, smart girl who was inspired by the kind bravery of a mysterious LTF agent. When she was young, a government official tried to take away her book, and this heroic agent saved it for her. But who was he? And why is her drill sergeant so hard on her? I love everything about this, and I will be pre-ordering the 2nd one. Yay! so much good stuff. Now I have to run away. I have 2 friends with babies on the way, and I’m running out of time to knit. I have been reading so much in the last month, that I don’t even know where to begin. This week I will be discussing a couple of Manga titles I read recently, but I have so much in the hopper. I just need to find time to sit at the mic. Firstly though, I have to point your attention to the very nice guys at Comic Geek Speak. After my last podcast where I was complaining about Secret Wars, Peter dropped me a line and let me know that over at their place they are going through it Issue By Issue. With their help, I might actually make it all the way through it. 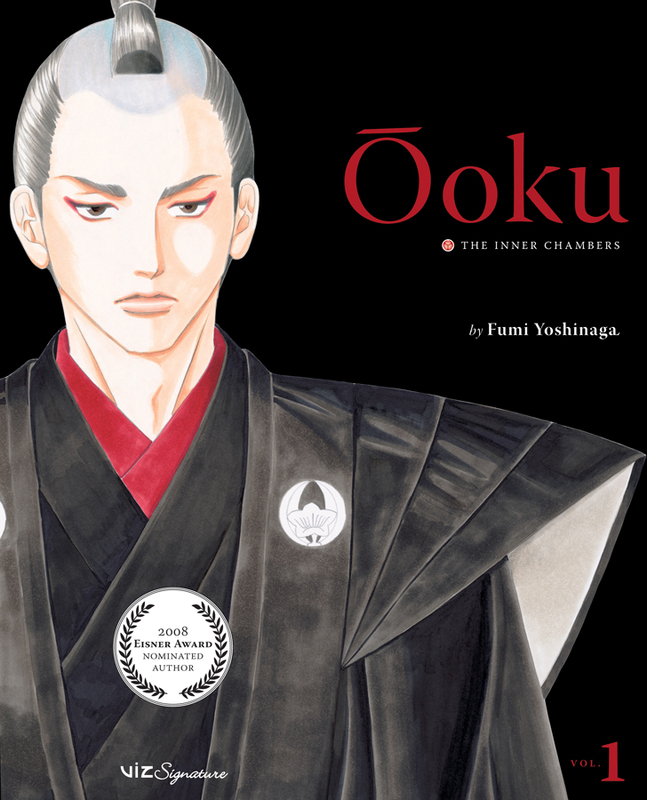 This is a beautifully drawn story of Japan under the Shoguns. The Lady Shoguns. Prize and was nominated for the best writer/artist Eisner as well. Good Stuff. story has grand adventure, magic, heroism, and monsters all set in a dark fantasy/sci-fi world. So cool. Well everyone, It’s time for SDCC. It would be so awesome if I could be there, interviewing creators and readers, talking comics with some alpha nerds. Eating good sushi. But it is not meant to be. I’ll just have to live vicariously through all the people who’s blogs and websites I follow. If any of you guys go, drop me a report. Or get Gail Simone to sign something to me or something. 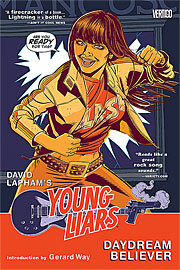 This title is Nominated for 4 Eisners this year, and I really think it has a good chance. I loved the story, but for me, this book’s big deal is the art. Amy Reeder Hadley’s previous manga style blends beautifully into a rich more western look. Little things from the attention to detail on Madame Xanadu’s jewelry, to the different emotions seen on the people’s faces in the mob at the beheading of Marie Antionette, give this piece an extra layer of depth. This book is one of my new favorites, and I’m going to be putting it into as many hands as possible. As soon as I get it back in stock. I had a lot of fun with this. Having read the novel, I already had a good idea what I thought this story looked like. Jim Butcher writes in a very visually descriptive manner, so seeing it translated to page this way is really cool. I feel like they got the important details of the story in with visual storytelling, avoiding the common pitfall in bad novel adaptations of having tons of text explaining the significance of things. I am looking forward to more of this. This really feels like a ground laying first book. They tell the initial adventure twice, from the different perspectives of the 2 main characters, and it doesn’t feel like it goes very deep. 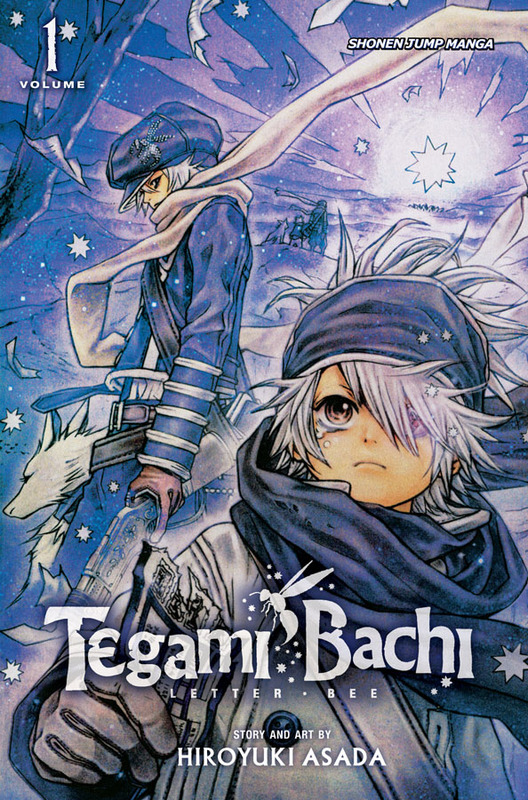 That said, what is here is a fun, light story with pretty artwork. I would be willing to keep reading to see if it gets more involved, but without a little more going on in the story, this is not a must for me. This will be a weekend of comics news, and I will be watching the blogs like crazy. People are promising big announcements, Warren Ellis is in town, and I am far away. At least I get to work in the garden. So I realized that I have been remiss in my duties as the wife of writer/creator. My husband’s 3rd book came out during the Christmas Madness, and I didn’t even mention it. So I would like to direct your attention to PX! 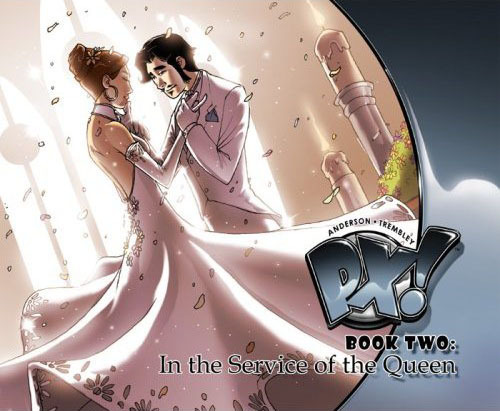 Book 2: In the Service of the Queen. I really enjoyed this an awful lot. 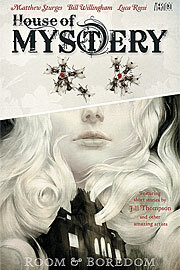 House of Mystery features layered story telling, varied and excellent art and a compelling connective tale. Also, the Bill Willingham story totally gave me nightmares, so hurray for that. I enjoyed this way more than I thought I would. I still prefer the Marvel Knights run though. After reading this, I feel reinforced in my belief that David Lapham hates everyone. Otherwise this was fun, if totally insane. This work, from the creator of Meru Puri and Vampire Knight is just as cute, angsty and well executed as you would expect. I really liked it, and I look forward to the second book once I get it back in stock.